As some of you may have heard, my older brother Lance is getting married tomorrow. Needless to say, I'm pretty excited for him. One nagging thing though--as the best man, I have to give a big toast tomorrow and I'm kind of nervous. 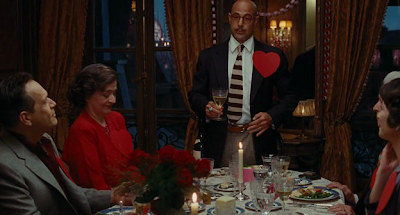 Mostly, I'm nervous because whenever I get up to practice my little speech, I inevitably forget what I had written and just segue into a weird ad-libbed version of Paul Child's toast in Julie & Julia. "Lance, you are the butter to my bread and the breath to my life. I love you, darling girl." I'm sure how you can all see how that might be a little awkward at the wedding. This is what my life has devolved into. Julie & Julia Quote of the Day: "This is what matters." Dude, just give Julie and Julia quotes with all the names switched out. It's almost like you've had 180 days of practice. And then post a video of it. I am sure Lance will understand that you were merely expressing your feelings about your two greatest passions: family and Julie&Julia. HAHAHHA. I will laugh if it doesn't go well. But good luck!